Presenting the latest procedures and standards from U.S. and international air traffic and regulatory agencies, this extensively revised resource covers the entire commercial aviation safety system--from human factors to accident investigation. The introduction of Safety Management Systems (SMS) principles by the International Civil Aviation Organization (ICAO) is discussed in detail. Commercial Aviation Safety, Fifth Edition delivers authoritative information on today's security concerns on the ground and in the air, changes in systems and regulations, new maintenance and flight technologies, and recent accident statistics. 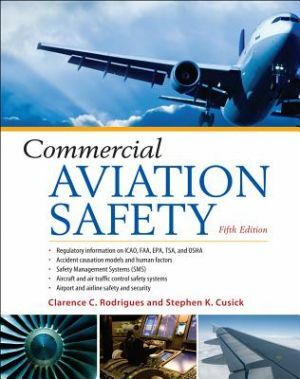 This is the most comprehensive, current, and systematic reference on the principles and practices of commercial aviation safety and security. Hardcover, Fifth Edition, 382 pages, Released August 2011. Clarence C. Rodrigues, Ph.D., is currently the Health Safety Environment (HSE) manager for the Petroleum Institute (part of Abu Dhabi National Oil Company - ADNOC) in Abu Dhabi. He was previously a tenured, full professor in the college of aviation and the program chair for the BS in Safety Sciences degree at Embry-Riddle Aeronautical University (ERAU) in Daytona Beach, Florida. Stephen K. Cusick, J.D., is Associate Professor of Aeronautics at the Florida Institute of Technology, College of Aeronautics in Melbourne, Florida and a member of the university graduate faculty for its Masters Degree program in Applied Aviation Safety. A former U.S. Navy Captain, flight instructor, and Naval Aviator, he is an active pilot with multi-engine, instrument, and helicopter flight ratings from the Federal Aviation Administration (FAA).